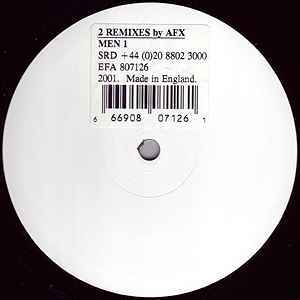 AFX shows off more of his remixing skills on 2 REMIXES BY AFX, a short EP. The mix of 808 State's "Flow Coma" is pure electro heaven, and DJ Pierre is given a speedy acid workout. And although I haven't deciphered the last track, as a matter of sonics, it's pretty fascinating, though I really wouldn't play it at a party. The remix of "Flow Coma" is the only really good track on this release. The Bonus High Frequencies song is actually an SSTV image that has text about programs used to make the release as well as a picture of Richard sitting on a couch. This image cannot be decoded through Winamp as previously stated. You are probably better off getting "26 Mixes for Cash" which has the "Flow Coma" remix on it and 25 other Aphex Twin remixes instead of this release. This is an outstanding release, Mangled acidic breaks first in the remix of Flow Coma by 808 State followed by the outstanding Hyperactive Box energy mix. The track "Bonus High Frequencies" is actually data that you can run through Win-Amp to reveal a picture.